How did you use your own unique ideas in your work? The idea of a pine cone I thought was pretty unique because it was something you don't seen drawn very often especially up close. The angle of the pine cone was also very unique and the details were different. Did you use a source for inspiration, then combine it with your own ideas to make it original? The fact that it was fall was very inspiring to me. I love fall and how the nature looks during this time. All I could think about is beautifully colored leaves all around me and then it hit me (not literally)! 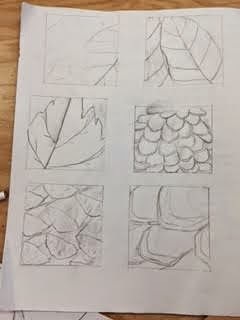 I could draw a pine cone! 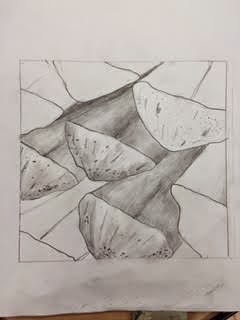 Leaves are so commonly drawn especially up close so I wanted to do something different but still related to nature. 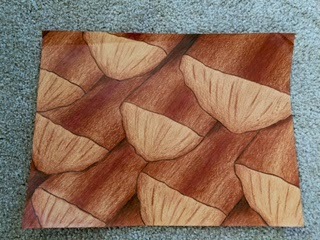 A pine cone was has rich browns and interesting shapes so it was perfect for something that had to have detail. When did you step back and analyze you work during this project? I stepped back and really analyzed my work at the end. I analyzed throughout the project but I really payed attention to all of the little details at the end. Now that I look at it I see I could've improved on some things. The transition of brown from the middle of the branch to the edges is kind of choppy and there is a large color variation there. Also some the branches are crooked and not pointing the same way. Lastly I think I could've added a little more detail and do a better job on the detail I did add. Overall the drawing is really unique and the colors look great. I like how I shaded underneath each branch a little, it gave depth. Did you pick a material or technique that was new or different over something that was familiar? I picked a familiar material. I used colored pencils because I had experience with them and I knew this project would be challenging if I wanted a real looking effect. I had to use multiple colors to get all the effects. I used black, tan/brown, and red/brown. Did you learn new techniques or processes as part of the work for this project? Not really because all I did was shade and color and create depth which I had already done before. Did you gain skill with familiar materials? Yes I gained skill with the Prismacolor colored pencils which I had only used once. I learned how to shade better with them and create different effects with the way I went back over the colors I had already put down.